2018 wasn’t a great year for the global economy as countries like Germany and China saw sharp growth deceleration. There is heightened political and economic uncertainty in 2019. 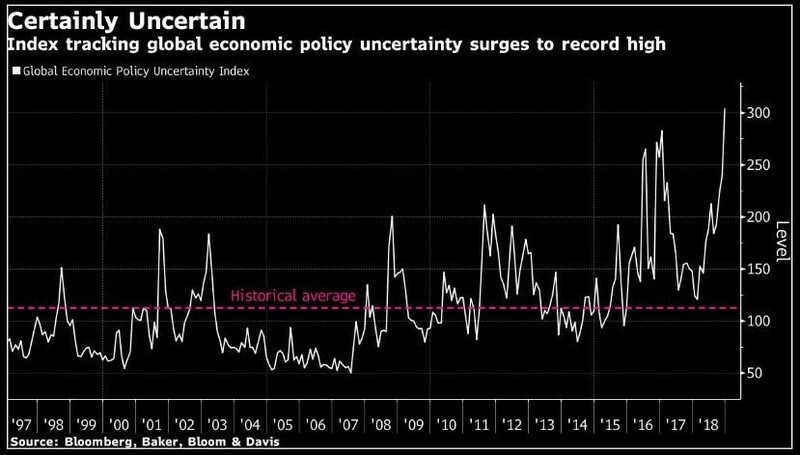 As you can see from the chart below, global economic policy uncertainty is higher than it has been since at least 1997. It’s even higher than in 2016 when the Brexit vote and U.S. presidential election took place. It’s 2019 and we are still wondering what to make of the Brexit. On March 29th it appears Britain will leave the EU. Britain is trying to make a deal with Europe to avoid a hard Brexit. A hard Brexit would make the transition period where Britain leaves the EU tougher. It’s a breakup without a plan to allow it to go smoothly and allow business to still take place right away. There is also uncertainty about the transition of the ECB head. Mario Draghi’s non-renewable 8-year term will expire on October 31st, 2019. The American government has been shut down for 27 days now. President Trump canceled House Speaker Nancy Pelosi’s trip after she wondered if the President would be able to give the State of the Union speech because the government is shut down. Global Economic Political Policy -That makes it look like both sides are far from agreeing to open the government. I see no way there will be a deal in the next few days. I still think leaders really don’t want government workers to miss another paycheck. We also have uncertainty with how China’s government will deal with its slowdown if the fiscal stimulus doesn’t work. We also don’t know if America and China will make a trade deal. American stocks rallied on Wednesday on a rumor that America would lower tariffs with China. However, the U.S. Treasury shot down that rumor, so uncertainty reigns supreme. Finally, we have the chart below which shows 36% of the planet is voting in 2019. The chart shows the populations of the countries voting and the month the elections are in. As you can see, India’s election is in April. India has now become the new leader in global growth since China is slowing quickly. India will soon pass China in population and total GDP. Sadly although younger people are making more there are less and less jobs. The simple fact is this may be caused by the evaporation of lower skilled jobs putting those who would have had them into the unemployment line. If you look at the unemployment of 18-30 year olds in government statistics it is not good.